It’s the quick or the hungry for the Noosa Food & Wine from May 20 to 22, as tickets for popular events are snapped up by those in the know, but there are still great chances to have a memorable food experience over the weekend. This year it’s all about letting the creativity of Noosa chefs shine showcasing the bounty of the region. They don’t have to work hard to locals convince that this is going to be a great event as over 60 percent of tickets sold have been to Queenslanders with interstate food lovers picking up the other 40 percent. You’ll know Ben from his stints on television (he can cook a mean barbecue) but this time, there’s the added attraction of outstanding Noosa views across Laguna Bay from Season Restaurant. Season’s Chef Andrew Tomlin is lucky enough to enjoy this scene daily, so his focus is going to be on the seafood menu spiked with local produce. It’s three courses with wine. Top tip: Ben is heading up the chef’s surfing team so you can catch him again at the Surfers Vs Chefs Breakfast at 6.30 am on Noosa’s Main Beach on Sunday. What happens when you get three chefs who know Queensland produce inside out and backwards, cooking together? You’ll find out at Peppers Noosa Resort & Villas when you sit down for a three-course meal and wine prepared by Executive Chef Andreas Nielsen and guest Chefs Matt Golinski and Alastair McLeod. With Matt and Alastair in the show, it’s sure to be a fun night made even more special with a performance by jazz, funk and soul quartet Jasper. Wines hosted by Iain Riggs, Chief Winemaker at Brokenwood. The first Embassy XO dinner is a sellout, so this is your only chance dine at XO during Noosa Food & Wine. It’s a four-course modern Asian dinner with Chinese and Japanese influences with matched wines and champagnes. 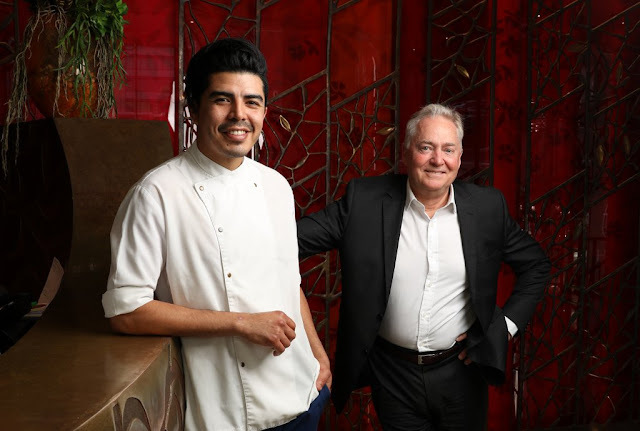 In the kitchen will be Embassy XO Chef Seungjoo Kim and visiting chef Hamish Ingham from Sydney’s Bar H. Since opening in 2010 Bar H has become a Sydney favourite for modern Asian food achieving one hat in The Sydney Morning Herald Good Food Guide. In 2000, Ingham was an integral part of the start@up team at Billy Kwong in Surry Hills where he honed his Chinese cooking skills working under Kylie Kwong. There will be plenty of chef spotting opportunities over the weekend with all chefs encouraged to bring their families and to make a longer stay. They won’t be wearing whites, but you will see chefs fishing Noosa waters and trying their skill at stand-up paddle board as well. It’s shaping up as a fun weekend. More on Noosa Food & Wine.